≈ spiced oatmeal-chocolate chip cookies. I’m back! Did you miss me, my sad, lonely, long-neglected, barely-clinging-to-life blog? Because I’ve missed you dearly. The thing is, not only have I not posted anything for (gulp) more than a year, but I’ve hardly baked anything over that period. A coffee cake here, a batch of cookies there, yes but I really haven’t been baking with anywhere near the kind of regularity that I would like. 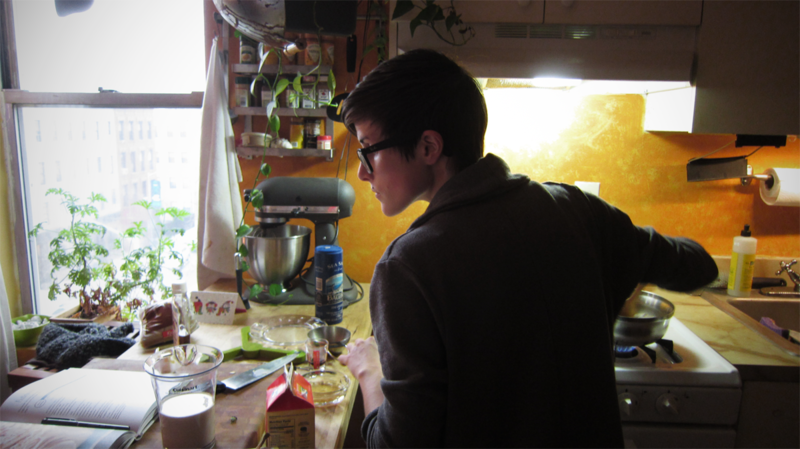 But it’s a new year, and I really, truly, sincerely want to bake – and post – more often. So I’m going to give it an honest try, friends. In that spirit, let’s hit the freakin’ road. Because I’ve been baking almost never, my cookbook shelf has felt very lonely. But a few days ago, I dusted the old books off and started poring through them. Did I want to start with something simple, like a coffee cake? Or maybe a batch of cookies? Or some kind of pudding or custard, in the spirit of winter? No on all counts, I decided; I chose instead to do something a little more ambitious. 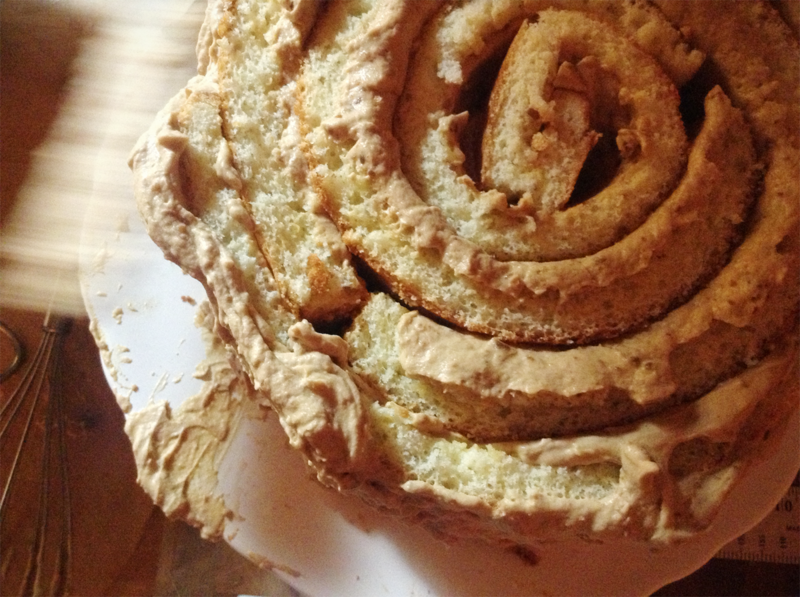 I received Julie Richardson’s lovely Vintage Cakes for Christmas this year, and, while flipping through it, my eyes landed on the recipe for this Butterscotch Cream Roll-Up Cake. Essentially, the roll-up is a chiffon cake (typically used for jelly rolls and the like) that is cut into pieces and wrapped into a spiral, with the pieces held together with butterscotch frosting. It looked lovely, and unusual, and delicious. And ambitious. All of those things added up to a sell for me. I got started right away. The first step is to make the butterscotch sauce that gets mixed with cream to make the filling and, eventually, dribbled on slices of cake. Incidentally, did you know that butterscotch sauce contains both butter AND scotch (i.e., whiskey)? Because I didn’t, and it was a revelation (and yet someone thought it would be a great idea to admit me to law school; it’s a funny world). At any rate, it’s delicious. First, you get out a saucepan and cook butter and brown sugar until they gets taffy-ish and smell heavenly. Then, mix in some cream and boil at medium-high heat until the color darkens and the sauce starts to smell ever so slightly like burnt sugar. Then, you remove the sauce from the heat, wait for it to cool a few minutes, and mix in a bit of scotch, vanilla, and salt. Then the sauce goes into the refrigerator to cool completely while you make the cake and the frosting. 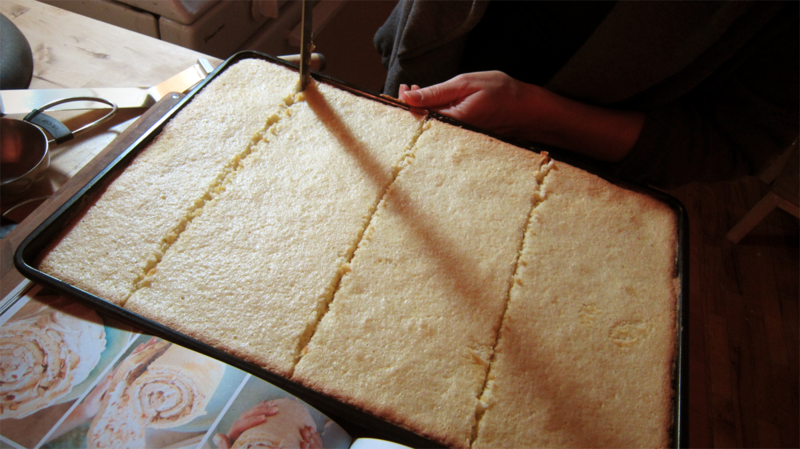 The cake is pretty straightforward: sift together the dry ingredients except a bit of the sugar. Then, you’re supposed to mix egg yolks, oil, water, and vanilla together. Here, though, I ran into a little bit of an oops: the recipe calls for six egg whites and four egg yolks. But I, being rusty at this whole “following baking directions” thing, accidentally used six egg yolks. Yes, that is 50% more egg yolk than the recipe calls for. But I have to say, the cake was, I think, the better for it. 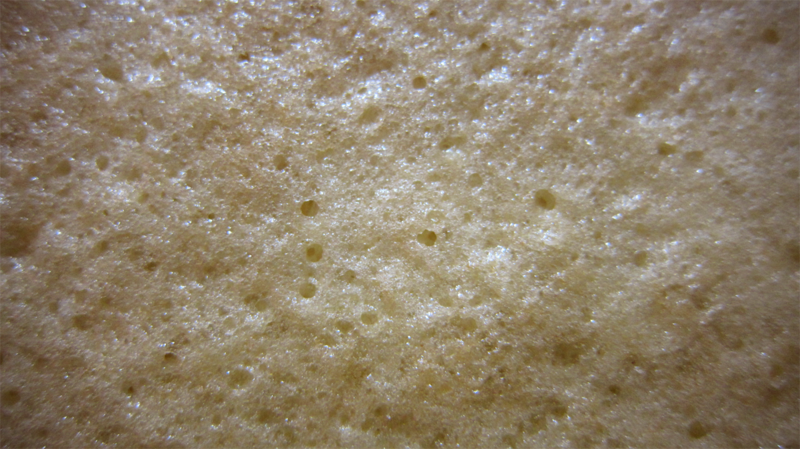 The crumb was a bit more moist than a typical chiffon; still light, but almost a bit pudding-like in its consistency. So, if you’re not afraid of egg yolks, I would suggest using all six, like I did. Or maybe five? I don’t know; give it a try, and tell me your thoughts and feelings. Anyway, after mixing the yolks, you mix the dry ingredients into the yolk mixture, whip six egg whites and some sugar to stiff, shiny peaks, then fold the yolk mixture and whites together. 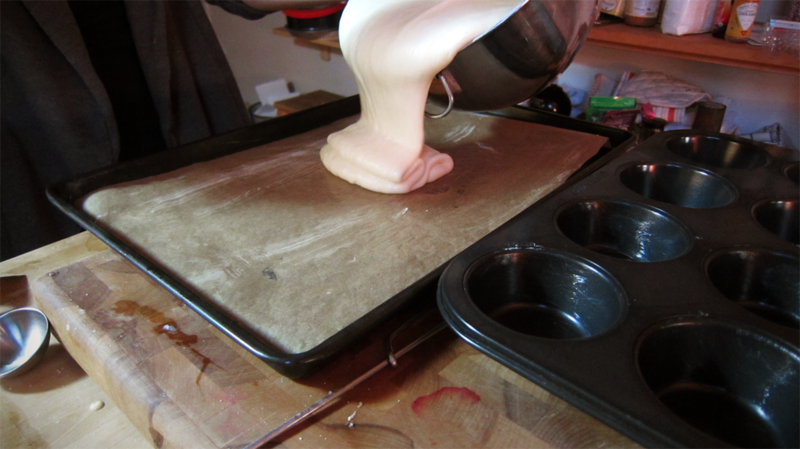 Then you distribute the batter onto a jelly roll pan. After the cakes are done, while they’re cooling, you make the frosting by mixing most of the butterscotch sauce with some heavy cream. 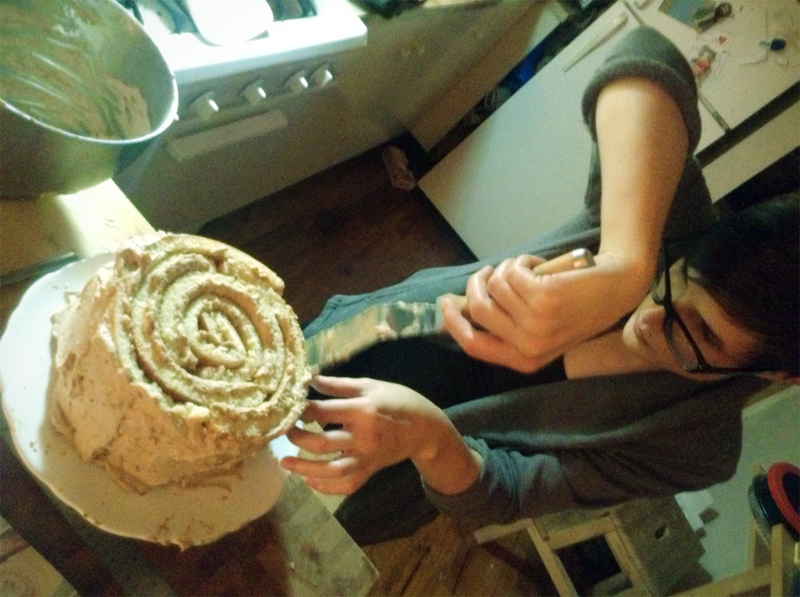 Then comes the really fun part: first, you cut the cake into slices with a serrated knife. You spread about half of the frosting over the slices, then start piecing them together like a little puzzle. Then you frost the outsides, and voilà! A beautiful cake to impress your friends, intimidate your enemies, and attract new lovers (or, you know, just to eat). After the cake chilled in the refrigerator for a bit to firm up, Kenan and I took it over to Chris and Jodi’s house for an evening of watching Treme (which I love, unreservedly and unabashedly) and eating cake. 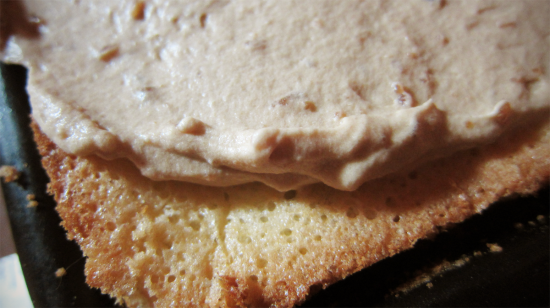 And the cake was, if I do say so myself, loverly: light, almost ethereal, and sweet but not toothache-inducing. It definitely felt good to be back in the game. 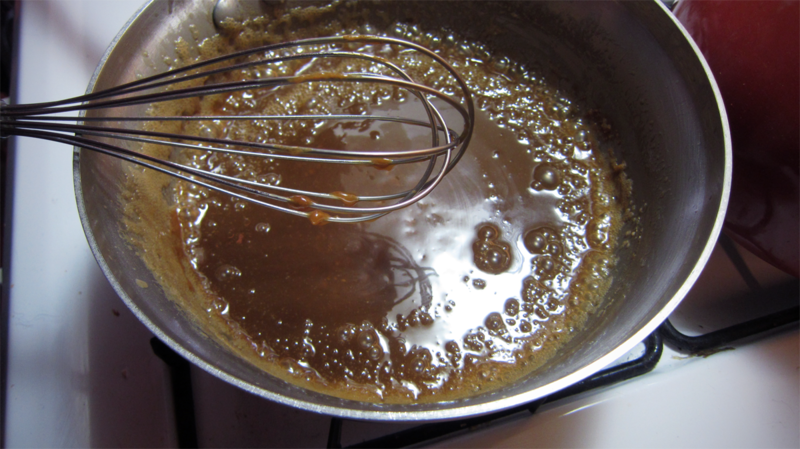 make the butterscotch sauce: In a large heavy-bottomed saucepan, melt the butter over medium heat. Add all the brown sugar and stir to combine. Cook, stirring frequently, until it begins to simmer and goes from having the consistency of wet sand to giving off a molasses smell and looking like taffy (approximately 3 minutes). Drizzle 1/4 cup of the cream into the pan and vigorously blend into the sugar with a whisk. Then, whisk in the remaining cream. Turn the heat up to medium-high and let the sauce boil, whisking occasionally, until it darkens, about 8 minutes. The sauce will get dark rather abruptly, and you want to make sure to remove the sauce from the heat as soon as it boils, so it doesn’t overcook. Remove the pot from the heat and let sit for 3 minutes before adding the whiskey, vanilla, and salt. Cover with foil and refrigerate until cold. Center an oven rack and preheat to 325. Grease a 12 x 16 inch jelly roll pan, line it with parchment paper, grease the paper, then dust with flour and tap out the excess. I didn’t have a 12 x 16 inch pan, but I was able to get by with a 10 x 14-inch pan plus an 8 x 12-inch sheet pan. make the cake: Sift together the flour, baking powder, salt, and 3/4 cup of the sugar in a medium mixing bowl, then whisk by hand. In a small bowl, whisk together the oil, yolks, water, and vanilla. Add the yolk mixture to the dry ingredients and stir with a rubber spatula, just until smooth. 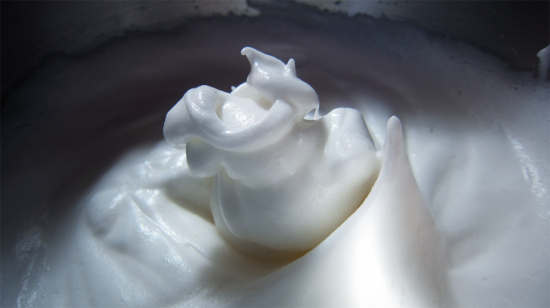 In the bowl of a stand mixer fitted with a whisk attachment, whip the whites on medium speed until frothy. Add the cream of tartar and slowly increase the speed to high, whipping until the whites just form a soft peak. 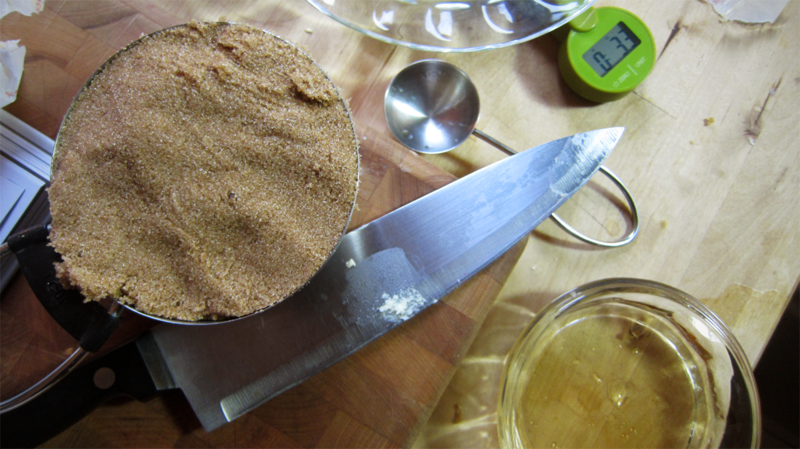 Put the speed back to medium and gradually add the remaining 1/4 cup of sugar in a steady stream. Return gradually to high speed and whip until the whites just begin to hold soft, shiny peaks. With a rubber spatula, fold 1/3 of the whites into the yolk batter, using as few strokes as possible. Add the remaining whites and fold just until incorporated. Pour into the prepared pan (or pans) and smooth the top with an offset spatula or spoon. Place in the oven and bake until the cake springs back when lightly touched and is a very light golden color, 16-20 minutes. Cool until the cake reaches room temperature (I stuck the pans in the freezer for a while). make the filling: While the cake is cooling, place the (cleaned) bowl of the stand mixer and the (cleaned) whisk attachment in the freezer for 5 minutes. Fit the chilled bowl and whisk to the mixer and whip the heavy cream and the 1 cup of the (chilled) butterscotch sauce on medium-low speed until just blended. 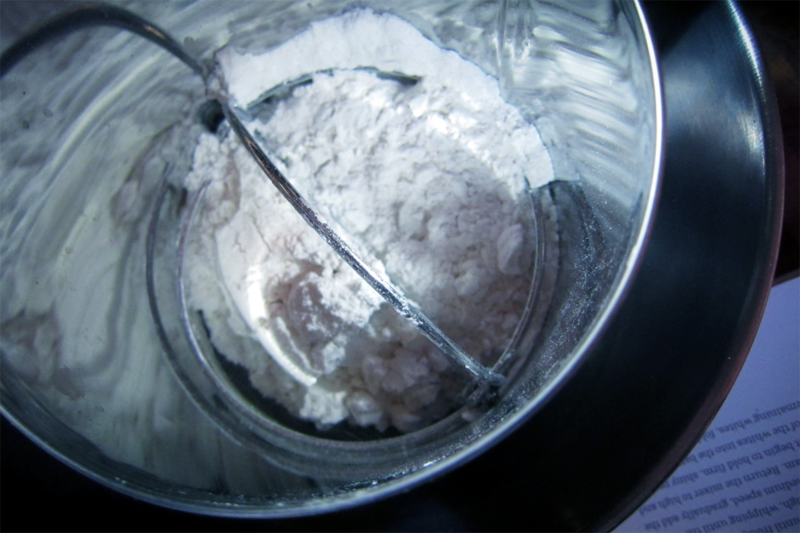 Slowly turn the mixer up to high and whip just until the mixture holds soft peaks. assemble the cake: Keep the cake in the pan and orient the pan so the longer side is nearest you. Cut the cake, with a serrated knife, into four equal pieces 4 inches by 12 inches (because I didn’t have the right size pan, I did three pieces that measured 4 inches by 10 inches (from the jelly roll pan) and two pieces that measured 4 inches by 12 inches (from the cake sheet pan)). 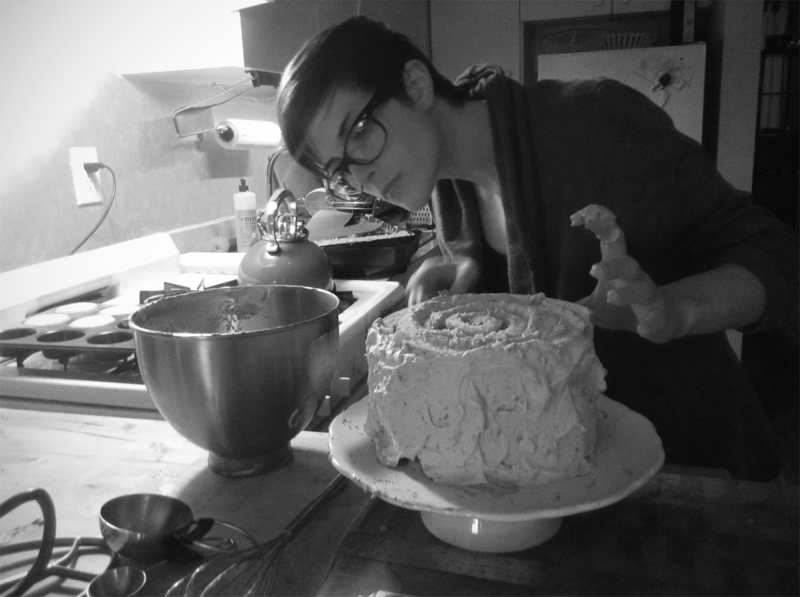 Cut through the parchment paper with kitchen scissors in the same places you cut the cake. Leaving the cake in the pan, spread about half of the filling over the cake and sprinkle with the toasted almonds. Refrigerate the rest of the cream while you roll the cake. With the pan still oriented with the longer side close to you, life the nearest edge (cake and parchment paper) of one of the strips. Using the parchment paper as support, tuck the cake into a roll and continue tucking and peeling away the parchment paper. 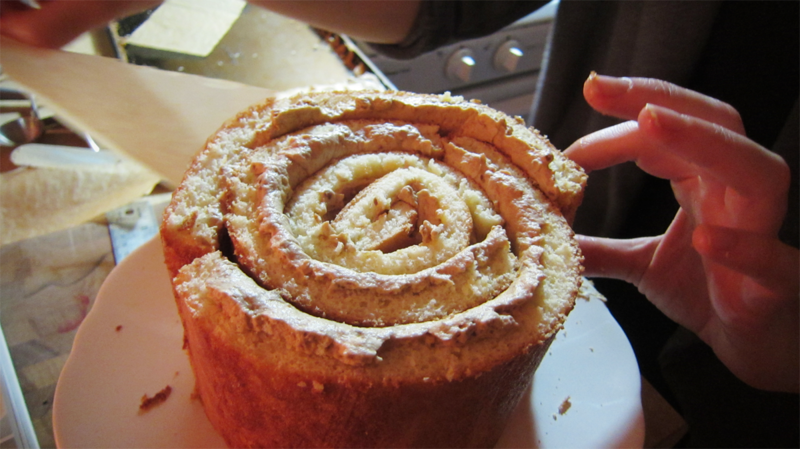 Place the rolled cake upright on a serving cake, so the spiral and filling are visible at the top. Lift the next cake strip, using the parchment paper as support, and wrap the strip around the roll on the serving plate, beginning where the outside edge of the first slice left off. Continue with the remaining strips to make one big rolled cake. Finish by frosting the sides with the rest of the filling (you might want to give the filling a few beats with a hand whisk to stiffen), leaving the top free to showcase the spiral. Refrigerate for at least 1 hour, lightly wrapped in plastic. The cake keeps, well-wrapped and refrigerated, for up to 3 days. serve the cake: just before serving, warm the remaining butterscotch sauce and drizzle it over the slices. photos by kenan, who, in case you haven’t heard, has a pretty new comic out. I would, literally, quit being gluten-free for you Cate. This cake looks freaking delicious! !